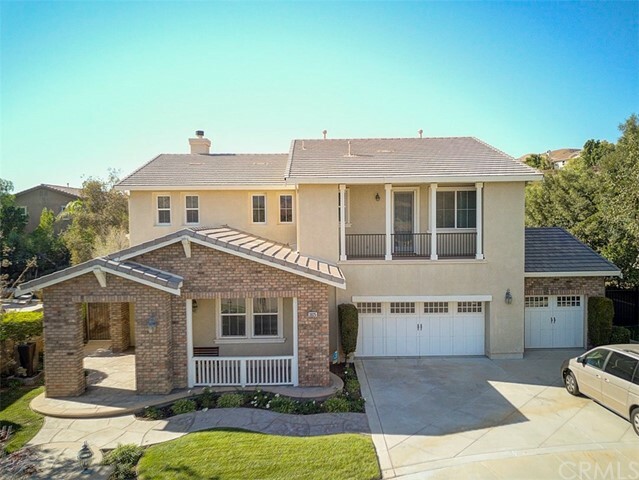 All Simi Valley homes currently listed for sale in Simi Valley as of 04/23/2019 are shown below. You can change the search criteria at any time by pressing the 'Change Search' button below. "Custom built Tuscan estate situated on a private view lot in the gated community of Glenmeadows, Home has 236 foot frontage. There is 6736 sq ft under the roof (3784 sq ft main floor/ 558 sq ft (additional MBR) over gar/756 sq ft guest house/858 sq ft over sized 3 car gar/780 sq ft loggia). Most salient feature is the attached private guest house which includes full kitchen, living/dining area, large bedroom, full bath, walk in closet and private patio with retractable awning. (Has direct access to patio and gar). Guest house has equally beautiful finishes. Truly is an entertainers dream. Yard has beautiful wildlife/city views. Features include pool/spa, complete outdoor kitchen, wood fired pizza oven, loggia with fireplace/flat screen TV (can be closed to the elements), five separate patio areas and six sets of french doors. Interior features a grand (14 foot) entrance with beamed ceilings, custom light fixtures, recessed lighting throughout, all Marvin windows/doors and hickory wood floors throughout. Kitchen features granite counters/custom tile backsplashes, Viking appliances, pot filler, copper farm sink, butler pantry and huge walk in pantry. Security sys, central vac sys, glass solar tile roof, tankless WH, 2' X 6' construction throughout." "Breathtaking French country estate in prestigious Big Sky! Custom construction single story, unparalleled in quality and detail. 3.6 acres nestled behind private gates w/ unobstructed views of the mountains. Stunning entry and folding floor to ceiling glass panel doors. Main floor is 4748 sq.ft. + a 462 sf. Ft. 2nd story bonus room/gym/office w/ full bath and closet. Additionally, a 700 sq. ft. guest studio w/ full kitchen & bath above detached garage w/ private entry. Great room has towering ceilings w/built-in wet bar, stacked stone fireplace and built-ins. Chef s kitchen includes Carrera marble and wood counters with top-of-the-line SS appliances, huge center island. Enter the master retreat and you will find luxury marble bath, dual vanities, marble counters, vanity, spa tub and steam shower with glass tile accents. Superior stone selection, hand finished solid wood posts and beams, custom trim/finish. Completely fenced and landscaped, including, a 10k gal. custom built Koi pond surrounded by a menagerie of beautiful plants. A bold and dramatic garden center piece and enticing view with bubbling center island and 2-2tier waterfalls. Back yard amenities include pool, built in bar-b-que, 2 covered patios, outside fireplace, space heating, outside shower." "SELLER MOTIVATED - BRING ALL OFFERS !! New Pricing ! Simi Valley 93065 Seller will Exchange Buyer's Property. One-of-A-Kind Entitled Luxury High-End Designer Residential APT Development Opportunity Unique Luxury Architectural Beautiful High-End Rich-looking Design absent additional cost. Unique River/Arroyo Heavenly Tranquil Retirement Senior Living Units with Balconies. Central Elevator to service Recreation Room Exercise Room Office Heavenly Designed Lush Landscaping with Beautiful Array of Drought Resistant Botanical Flowering Trees Plants Mountains Views. Backs Up to Arroyo Stream Easy Access to River Walkway Washer Dryer in Units and in Common area Plans Currently in Plan Check." "ESTATELY ELEGANCE Relax and enjoy your private life in this 4,111 sq.ft. Morrison Highland Estate home.Built in 2000, with its 5 generous bedrooms, a home office, 5 bathrooms, 3 fireplaces, a gourmet kitchen and soaring ceilings, it is easy to leave your troubles at the door! Travel on beautiful wood floors through pillared arch doorways into rooms lit by charming chandeliers. Dine in elegance with picturesque views. Drop into the luxurious sunken tub and feel your spirit lift as you are flooded by all of the natural light! Step out into the private backyard and this peaceful paradise becomes an entertainer s dream come true! The home stands on nearly an acre of gorgeously landscaped yard so beautiful that you could host weddings and/or private parties. Refresh yourself with a dip in the pebble tech pool. Soothe those sore muscles in the spa. Enjoy the splash of the waterfall while warming by the fire pit at night. Sun bathe and doze in a hammock on a lazy afternoon. Spent over $100,000 for 44 feet RV parking. This is a lifetime home in a beautiful setting and it is ready for you to make it yours!" 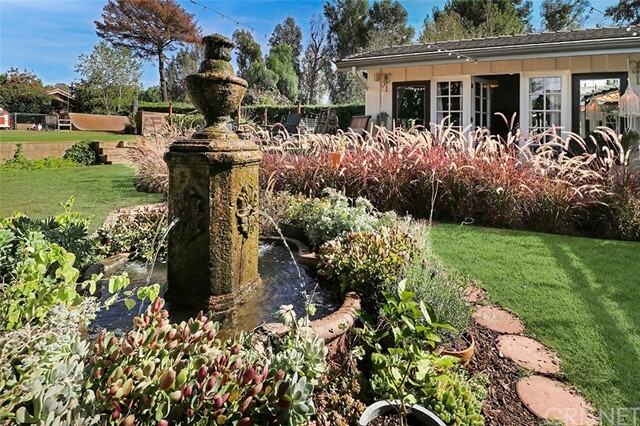 "Welcome to this one of a kind Simi Valley estate; zoned for horses; sits on over an 3 acres of land and could be a future development project in the future. Recently updated, this home features a living room, family room, sun room, a modern kitchen with breakfast bar an open floor plan through out. The master bedroom boasts a private bathroom and access to the rear grounds plus and all rooms are spacious! There are two 2 car garages, a sparkling swimming pool, horse stalls and plenty of space for horses. Offers mountain views on a low traffic street. This is a must see property!" 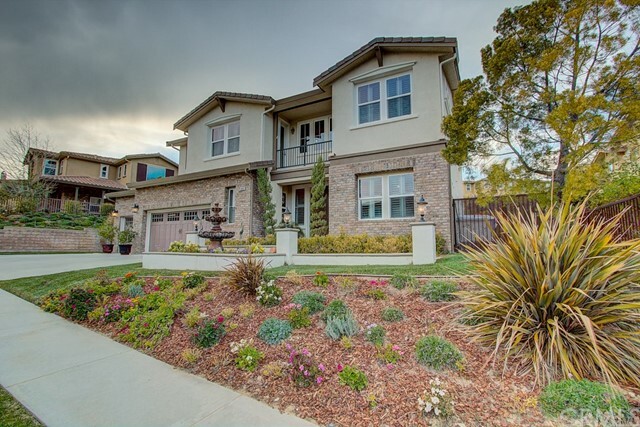 "Don't miss out on an opportunity to call one of the most exclusive neighborhoods in Simi Valley home. Lush tree lined streets and this secluded setting make for a relaxing escape and comfortable yet elegant place to call home.Enjoy complete privacy and relaxation in this small enclave of 29 homes tucked in the Exclusive Morrison Highlands Estates! Large open floorplan boasts over 4000 sq. ft. with 5b+4.5 ba, formal Dining,downstairs office and bedroom w ensuite and custom temperature controlled wine closet. Prime location on over 20,000 sqft. lot with Possible RV parking.Oversized, finished,3 car garage comfortably houses large vehicles,while also providing lots of built in storage.Seperate laundry room comes fully equipped with oversized sink and built in storage which can be used as a secondary dry pantry.The landscaped yard yields fruit trees and 3 separate patios to relax or entertain. As you step into the elegant formal entry notice the soaring ceilings and manufactured real walnut wood flooring.Stunning custom built-in's in the office, large open kitchen w/ center island & a backyard fully equipped with cabana, fireplace and opportunity for guesthouse conversion. This property has dramatic custom touches throughout you have to see to believe!" "Completely turnkey property here. Located in one of the best tracts in Wood Ranch, this resort style home is exactly what you've been looking for. Completely renovated, top to bottom. Immediately upon entering the home it's clear that this is a special place. The downstairs features high ceilings, wood floors, custom painting and wood trim finishing, remote control windows coverings, and designer touch's. The cooks kitchen is ideal for even the most discerning chef. Featuring stainless steel appliances, 6 burner Thermador stove top/oven, abundant cabinet space, and large center island, This is the perfect place for entertaining family and friends alike. Office with custom built-in's complete the downstairs area. The upstairs features wood floors, large master bedroom with sitting area, gorgeous master bathroom, 3 additional bedrooms, and a spacious loft. Tranquil views adorn every room in the upstairs area. The resort style back yard is exquisitely done with a pool & spa that would challenge any 4-star resort. The elegant water features, swim up bar area with in pool seating, and a sunken built-in BBQ space complete this backyard paradise. A large grassy area for the kids/dogs to play is also available. This home is a true gem that is not to be missed!" "Range priced. Seller will entertain & respond to all offers between $1,139,000 and $1,249,000. Luxury living at it's Absolute Best! 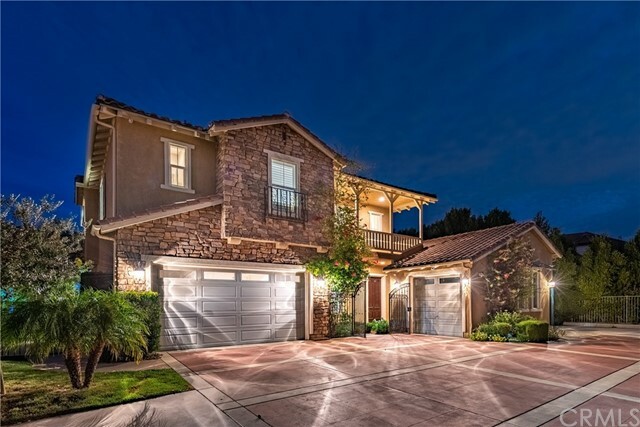 Stunning Encantada estate nestled high in the hills of Simi Valley. This stunning property is situated on a premium lot with unobstructed city light & mountain views. Enter the private gated courtyard with custom pavers, professional landscaping & water feature making it the perfect tranquil setting. Enter the grand foyer & you are greeted by soaring ceilings, oversized staircase & an open inviting floorplan. The elegant living room is accented w/custom window treatments, large windows & opens to the true formal dining room. The warm & inviting family room has a built in media niche, fireplace & views from every window. The chef s kitchen is upgraded w/custom cabinets, granite counter tops & backsplash, stainless steel appliances, center island, large breakfast area, walk-in pantry & French doors leading into the courtyard. One bedroom w/en-suite is conveniently located downstairs. Upstairs the spectacular master suite is complete with a large balcony w/amazing views, walk-in closets & en-suite w/double vanities, shower & soaking tub. There are 3 additional upstairs bedrooms & a large bonus room. The incredible rear yard overlooks the city with breathtaking views. This outdoor retreat is complete w/custom pavered patio, grassy area & fruit trees. Add'l features: water softener system, plantation shutters, exquisite crown molding & two garages." "Location, Views, Gated Community and a Single Story! Does it get any better than this? This single-level home has no steps at all and is nestled in the coveted Big Sky community with endless views of the rolling green hills and majestic mountains. Enter through the grand hallway that brings you to the formal living room and dining room where you are greeted with an elegant fireplace and soaring ceilings. The gourmet kitchen combines all of the essentials for the family chef including a large Sub-Zero fridge, a huge center island for prep work and a Wolf range to finish the job. The kitchen opens to the family room which has amazing views and another beautiful fireplace, making it the perfect room to relax in. The spacious master suite is fit for royalty with an over-sized walk in closet, a jetted tub, his-and-hers vanities, and a large walk-in shower. All the carpet has been removed from this home making it allergy friendly! The entertainers backyard offers total privacy, breath taking views of White Face Mountain and comes complete with a BBQ center, fire pit and putting green. Welcome to paradise living!" "REDUCED BY OVER $50,000.! Entertainer's Dream! 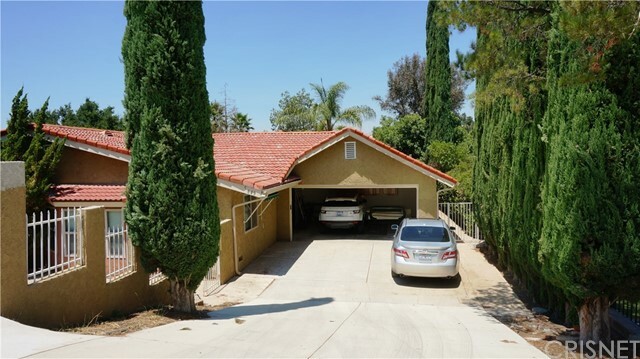 Located on one of the most desirable streets in Simi Valley on approx 1/2 acre!! This 4, possibly 5 bedroom, 3.5 bath home offers the master bedroom suite downstairs with french doors leading to the amazing backyard. The master also has an adjoining room which could be used as a gym, office or an additional walk in closet. If you are a car enthusiast, this space can also be turned into a 4th garage (an original builder option).The master bathroom has 'his and hers' vanities with granite counters, an over-sized shower and walk in closet. Chef's kitchen is open to the family room and has an oversized center island, loads of cabinets, granite counters & top of the line KitchenAid stainless steel appliances. Living room with cozy fireplace and the dining room is perfect for entertaining.Upstairs this home boasts 3 spacious bedrooms plus a loft, recesssed lighting, high ceilings and many windows to allow lots of natural light enter this amazing home.The front bedroom has a balcony to enjoy the views & open space. The oversized resort-style backyard offers privacy and has a one of a kind 'lazy river' style pool, beautiful palm trees, grassy areas, fire pit & R.V. parking. 3 car attached garage. Walk to parks!" "Move in to this beautiful corner lot in The Crest at Wildhorse Canyon just in time for Summer and make this backyard oasis yours! This spacious 5 bedrm / 4.5 bath house has upgrades galore including a completely remodeled master bathroom suite, his and hers walk-in closets with built-ins, high end faux paint throughout, travertine and wood flooring, iron stair rails, granite counters in all bathrooms and kitchen, market lights in backyard, salt water pebble tech pool with beach entry and waterfalls, gazebo with a built in bar, built in BBQ, fire pit next to the spa, and lush landscaping! Inside you have space for everything you need and more with the spacious master retreat, 4 additional bedrooms, a large family room directly connected to the kitchen and breakfast nook, formal dining room, pool table/game room, a large upstairs loft, and a bonus room currently set up as a gym! As you walk through the open layout with lots of bright natural light throughout you will see how you will enjoy this home inside and out!" "Located in Jasmine Glen Estates! This is a small enclave, gated community in Central Simi Valley, nestled in the hills North of Freeway. As you enter through the custom front doors with leaded glass and iron work you step into the spacious foyer with grand circular staircase. This lovely home offers large eat-in kitchen with stainless steel Viking stove, double ovens and refrigerator with a Bosch dishwasher, granite counters and abundant maple cabinets that opens to family room with a cozy fireplace. The living room features two 150 year old leaded glass windows that frame the formal fireplace. There is a large butler's pantry with custom stained glass art above the doors. 1 bedroom downstairs with 3/4 bath adjacent which features a Waterford Crystal light fixture. Italian marble floors recently installed in Master Bath and Guest Bath upstairs. Large master bedroom suite and 3 additional bedrooms upstairs. There is a new 75 gallon water heater, there are dual air and heat units, a central intercom and alarm system, recessed lighting and more! Rear yard has a large covered patio, koi pond and walking bridge that features a custom waterwheel." "Beautiful 2-story home on cul-de-sac, in Wood Ranch! High ceilings, natural light and tasteful finishes throughout. Upon entry, you'll find formal living and dining rooms, leading into open living spaces. Rich wood flooring, plantation shutters and recessed lighting. Kitchen boasts granite counter tops and large center island, opening to eat-in kitchen, built-in desk and family room with fireplace. Hallway leads to private downstairs bedroom with en suite bath, wrapping around to powder room, and staircase. Upstairs, hallways lead to two bedrooms with jack and jill bath, an additional en suite bedroom, and a spacious bonus room, ideal for office, media room or playroom. Master suite complete with sitting area, walk-in closet, and bathroom, including separate spa tub and shower stall. Backyard complete with Pebble Tec pool and spa, tropical landscaping and covered patio. Privacy at its best! Laundry room downstairs, with direct access to 3-car garage. This home is a stunner...come check it out!" "Stylish Country Living.Gorgeous One-Story Ranch Home located in the unincorporated area of West Simi Valley. With a rustic & chic feel, this home is an absolute dream! Farmhouse designed with open concept, 4 bedrooms (2 masters), 3 baths, 2323 sqft of living space, cul-de-sac, RV parking, circular driveway, stunning backyard & beautiful trees.Fall in love with this home s style & charm. Grand family room, vaulted wood beam ceilings, wood burning brick fireplace & recessed lights. French doors, lush carpet & wood flooring throughout. Country kitchen & dining area offers tile counters, wood cabinets & view of the yard. On the left side, you will find 2 guest bedrooms with a jack & Jill bathroom, along with the original master bedroom & bath. On the other side of the home is a 2nd master bedroom & bath. Light & bright, this spacious suite offers vaulted ceilings, mirrored closet doors & french door that bring you to an outdoor wood deck! Retro style Master bath features walk in shower, soaking tub, dual sinks & wood tile floors. Step outside to a spectacular rustic retreat! Enjoy magnificent shady trees, numerous sitting areas, outdoor patios, reclaimed wood bar, water fountain, fire pit & more. With a 18430 sqft lot, this backyard offers space & PRIVACY! This space also includes a garden, chicken coop, a shed, & did we mention a quarter pipe skate ramp? The community has an option to purchase Sinaloa Lake rights & Membership to the pool.Call today, fall in love & make it yours!" "Welcome to 5053 Shady Trail, where you will find the perfect blend of home, luxury and outdoor living on a spacious 14,000sf lot. From the finished three car garage to the media room, there is something for everyone to appreciate. Downstairs provides a grand entrance, travertine flooring, home office, powder room, formal living/dining room, bedroom and bathroom, large chefs kitchen over looking the family room. Upstairs boasts a Master Suite, large master bathroom and dual walk in closets. For convenience, the laundry room upstairs has plenty of storage and a sink. Two additional bedrooms and two bathrooms plus the media room complete the second floor. The back yard is full of color; places for sun, shade, rest and for play. Access to the pool and patio (with auto canopy) is off the kithchen and great room, making it perfect for entertaining with convenience. The home is easy access from highway 118, surrounded by hiking trails, open space and a rare find." "From a gorgeous backyard to a spacious, updated house, this is a property that will be sure to please all buyers. Waterfalls and decorative fire pits adorn this large, pebbletch pool and spa with views of the valley and mountains. After a dip in the pool, dry-off next to a built-in fire pit with ample room for several people, or grill dinner on the built-in BBQ. Inside this home, you will find a beautifully designed kitchen with granite countertops, a large walk-in pantry and an oversized island that overlooks the living room. The living room has a large built-in and a decorative fireplace. In addition to the kitchen and living room, the downstairs area boasts a formal dining room, a formal living room, a downstairs bedroom with its own bathroom, and a 1/2 bath. A large master bedroom with an expansive master bathroom joins three additional bedroom and a loft area upstairs. Additionally, there is a exterior walk way that leads to a detached room, currently used as a man cave. Other features include newer energy efficient pool pump, carpet, paint, toilets, and light fixtures. Additionally, buyers will enjoy the custom shelving in bedrooms, custom built-ins in master bathroom, and the ceiling fan in the living room." 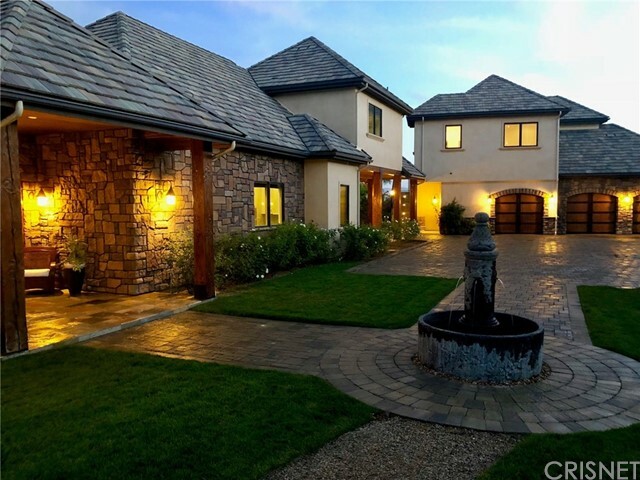 "Sought after Castlewood Estates-Luxury home with 6 bedrooms and 6 baths in the sought after Big Sky Community. This home features formal living room with cathedral 30 ft ceilings and beautiful statement fireplace mantle. The Gourmet Kitchen is a chefs delight with French Country Cabinetry granite countertops, walk in pantry, under mount dual basin sink, full sprinkler system, set for alarm system, stainless steel appliances, High end Bosh self cleaning double ovens, gas cook-top with ventilation hood, microwave & dishwasher. Granite topped center island w/breakfast bar and built-in desk great for organizing busy family activities. The family/media area has lots of windows as well as recessed lights and fireplace. Formal dining room w/recessed lights and chandelier. 2 downstairs bedrooms allow privacy and inhome office or creative space. Upstairs has custom built-in bookcases which is ideal as a library/office. Master suite w/jetted spa-style tub, large shower w/bench & new upgraded flooring. 2-car garage with lots of storage space. Castlewood is the most exquisite area of Big Sky and most sought after. Offers a park-like setting & is close to some of the best hiking and mountain biking trails in the area." "Spacious Luxury Legacy Collection 4 Car Garage Home! Front door opens to spiral staircase. One bedroom and bathroom located downstairs. Sizable formal living room flows into formal dining room. Recently updated spacious kitchen open to family room with wet bar, great for entertaining. upstairs you'll find 3 generous size bedrooms plus an Extensive Master bedroom with fireplace. Master bathroom has been tastefully updated with large shower stall, free standing bathtub and his / her walk-in closet. Home sits on one of the largest, if not the largest lot in Legacy! Plenty of room for RV access, if desired. Backyard offers covered patio with electric heat lamps and BBQ area. Large grass area with sports court and plenty of space for the custom pool. If you're looking for the opportunity to move in to the Legacy, this is it. Check this one out!" 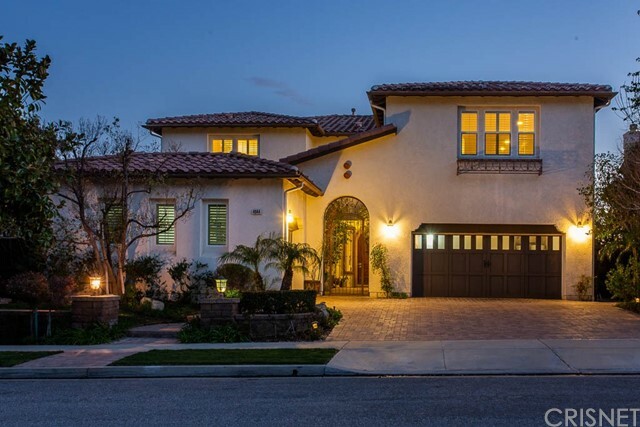 "Head turning curb appeal in this top of the hill, cul-de-sac estate, featuring expanisve, high volume, open floor plan and tons of natural light. Recently upgraded kitchen with stainless steel appliances including new built in fridge with open access to family room area. Downstairs bedroom and full bath. Bright light living room and formal dining room upon entry. 4 bedrooms upstairs indluding loft style bonus room/game room area and additional space for small private office/desk type area or workout area. Beautiful master suite and large secondary bedrooms. Backyard features built in fireplace, pool, and spa surrounded by removable pool safety fence. This includes recently upgraded pool energy efficient multi-speed motor, pool filter, and WiFi remote control system. Garage doors have been recently upgraded and insulated with WiFi controllable motors. Nest thermostats throughout. This is a must see property." "Stunning Brentwood home sitting on a lovely view lot hosting 5 bedrooms, 4.5 bathrooms, $1000's in upgrades with two master suites, downstairs and upstairs. Features include 4347 sq. ft. of living space, an 11,280+ sq. ft. lot, distressed wood flooring, marble and travertine accents in master bathrooms, neutral wall colors, upgraded LED lighting throughout, designer carpet, beautiful dark wood cabinetry throughout, a granite island kitchen with stainless GE Monogram appliances, a breakfast nook, a Butler's pantry, a bonus room near the kitchen, formal living and dining rooms, a family room with a fireplace, a striking curved staircase, a loft, Jack & Jill bedrooms with an adjoining bathroom, an upstairs secondary bedroom with a Juliette balcony, and a lovely upstairs master suite with dual walk-in closets and more. The spacious backyard is perfect for entertaining a large crowd, displaying a large patio and grassy yard with a view to the distant Simi hills. The sparkling lights at night are beautiful! Other features include a 2-car garage with lots of storage, two 240V EV charger station-ready, landscape lighting and much more! Located near parks, award-winning schools, shopping, restaurants and just a short distance to the 118 Fwy. or the 23 Fwy." "Private Entertainers Pool Home located in the gated Legacy Estates of Wood Ranch. This wonderful family corner lot home features a tropical entertainer's backyard with mountain views, pool, spa, and rock waterfall, covered concrete patio, large grassy play area, and built in outdoor bbq. You enter into newly refinished hardwood floors, and volume ceilings in the large foyer that is open to the living room with fireplace. Large office that has great natural light and smart built-ins. One bedroom with private bath downstairs, powder room, indoor laundry with sink, formal dining room with french doors to backyard. Spacious family room and fireplace open to gourmet kitchen, with granite counters, built-in microwave. Spacious master retreat with fireplace upstairs. Third and Fourth bedrooms have their own separate play room. Possibilities are endless.... reconfigure and have two master suites??. 3-car garage with direct access. This fantastic neighborhood is close to great schools, golf course, outdoor mall, parks, and endless hiking trails..."
"Spacious & Welcoming Hillsborough In Wood Ranch With Gorgeous Landscaping, VIEW, Pool/Spa, Built-In BBQ & Fire Pit All In Time For Your Summer Entertaining & Relaxation!! This Lovely Residence Is Complete With Decor Wall Colors, Recessed Lighting, Newer Flooring, Ceiling Fans, Granite Center Island Kitchen w/Walk-In Pantry & Open To The Inviting Family Room w/Media Niche & Raised-Hearth Fireplace!! The Sumptuous Formal Living & Dining Rooms Are The Epitome Of Casual Elegance. The Upstairs Bonus Room Is Perfect For Entertaining The Kids & Their Friends!! The Spacious Master Suite Is Restful & The Master Bath With Separate Shower, Soaking Tub, Dual-Sink Vanities & Walk-In Closet Is Pleasantly Serene & Tranquil. The Front & Rear Yards Of This Exceptional Residence Are Ultimately Inviting & Lushly Landscaped!! A Spacious 3-Car Attached Garage Has Additional Storage Areas!! This Lovely Home Is Move-In Ready For YOU!!" "Wonderful opportunity to own this beautiful home nestled on a lovely cul-de-sac. This home has 4 large bedrooms with one bedroom located downstairs. Three bedrooms upstairs with a very large master suite connected to a large welcoming balcony overlooking the backyard. There is a large office downstairs by the updated kitchen and a recreation room upstairs. You will enjoy the formal sitting area when you enter the home as well as a second formal dining area. The laundry is conveniently located on the second floor next to a built-in desk. There is plenty of space for parking and storage in the large three car garage and the beautiful grounds around the home. All of this can be yours!" "Situated at the top of a long driveway, this gorgeous Wild Horse Canyon pool home is sure to impress. The home has 5 bedrooms, 4 1/2 baths and a large loft that makes for a great playroom or a secondary living space. Downstairs features a guest bedroom and full bathroom, beautiful office with built-in desk, a large kitchen with plenty of cabinet space, center island, a large pantry, stainless steel appliances, 6 burner cook top, and double ovens. Huge family room with built-in entertainment center is just off kitchen and is perfect for family time. The upstairs master suite has a dual sided fireplace that separates the sleeping area and sitting area, his and hers walk-in closets with built-ins, a double sink vanity, a large shower and separate soaking tub. In the backyard you'll find an outdoor kitchen, a beautifully landscaped/hardscaped yard, custom pool with a tanning ledge and fire bowl, and a gas firepit. Don't forget to take in the views off the front balcony. You're sure to fall in love."